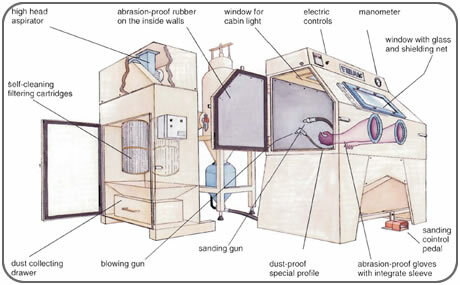 Cabins for pressure sanding/shot-peening series "VP"
The series "VP" is referred to machines throwing the abrasive through a system named "by pressure". 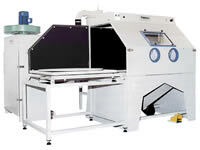 This series includes two standard models featured by the enlarged dimensions of the working area. 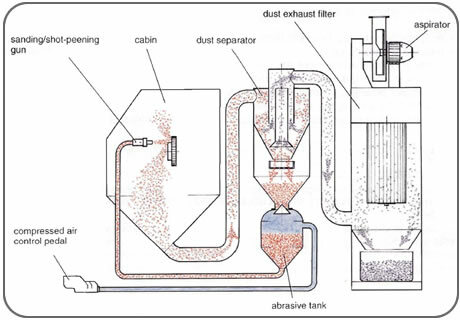 All models arrange a centrifugal dust separator for recovery and restore of the abrasive. 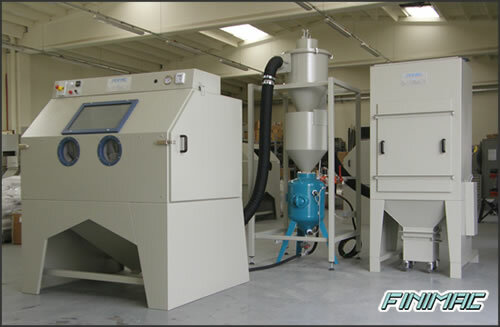 The separator provides a double adjustment allowing to work with abrasives having size and specific weight very different as to get an excellent degree of dust exhaustion. 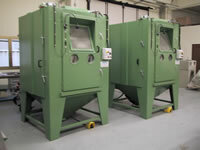 All parts of the machines are painted by epoxy powders -furnace baked- as to get them really wear-proof. 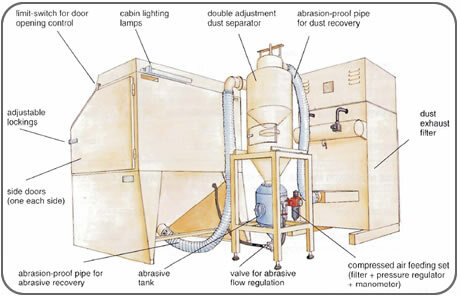 Abrasion-proof special rubber sheets are lining the inside walls of the cabin and of the dust separator. 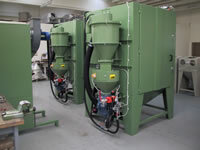 The "pressure" operating machines carry-out the abrasive throw through a special gun that, by means of an abrasion-proof pipe, is connected to the abrasive collecting tank. 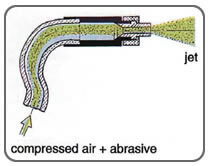 Once put in pressure, the tank conveys the abrasive, through the piping, to the gun from which is outcoming a throw characterized by a large power and a high working capacity (about 4-5 times higher than a vacuum-operator machine). The gun can be easily moved, in order to position the throw towards the piece to be treated. • the time of treatment for unit of surface. • preparation of surfaces for anchoring of metals, paints, rubbers, ecc. 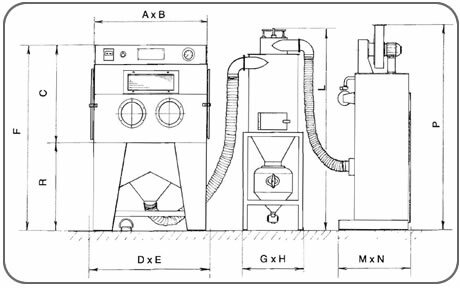 • dust exhaust filter, with large surface cartridges, complete of self-cleaning automatic cycle through compressed air throws.